Gold Cross dyes have a low toxicity (serious injury is unlikely unless large amounts are consumed). 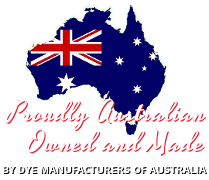 Dyes must not be inhaled or taken. What are the differences between Gold Cross High Temp & Low Temp Dye? Which dye is most suited to individual fabrics? High Temp Dye is most effective on Cotton, Rayon, Hemp, *Nylon and *Wool (*with the addition of vinegar). How many colours are in the Gold Cross range? The Gold Cross High Temp range comes in 30 colours and the Low Temp Dye is available in 29 colours. Are Gold Cross Dyes colourfast? What does Gold Cross Stripper do? Stripper may be used to remove stains and prepare fabric for dyeing. It will also remove Hight Temp Dye (for re-dyeing). Not recommended for Low Temp Dye. There are three obvious reasons why this can occur. 1) Not enough dye for weight of fabric or quantity of water used. 2) Incorrect water temperature – high temp dyes, in particular the dark colours, require boiling to produce a strong colour. 3) Recommended amount of salt or vinegar was not included in dye bath. How do I dye my garment in 250ml of water as it says in the instructions? You can’t! This question is often asked by people who have failed to read the instructions correctly (refer instructions on High Temp dye). Remember – always read the instructions fully before attempting to dye. Why do dark colours never seem to come out as dark as they are on the lid? All of these dyes especially black, navy, violet, maroon and other dark colours in the range, require boiling when being dyed to get the full strength colour. Darker colours need this heat for a longer period of time (about 40min) to be successfully introduced into the garment. Other possible causes for this result are not using enough dye for the weight / fibre of garment or when a polyester content is in the garment. With the Low Temp range the most common reason for the lack of depth of colour in the garment is due to the required amount of cooking salt not being added to the dye bath. Remember for dark colours always add 250g salt to the dye bath. 125g salt is sufficient for lighter colours It is also important to realise that with Low Temp dye the colour and fastness of the darker colours may be improved with the addition of an extra 25g Setting Agent (available separately). This is especially important with black, violet and navy.